Three Essie polishes to inject a little colour into Spring 2011. The shades you could win are: Pink Parka, Mint Candy Apple & Bermuda Shorts. Leave a comment to enter. Giveaway closes at 23:59GMT on 12th January. Winners will be announced early in the New Year. Info and rulez can be found here. Love these, please enter me. Ta! These colours remind me of easter eggs – can’t wait for spring! Mint Candy Apple has been on my wishlist forever! It’s divine. That pink colour is just calling me!! enter me!! <3 love love love! Loving the mint candy apple! Ohh, I love Essie and I don’t have any of these! I lovee Essie polishes and these colours are gorgeous! i’ve never tried essie before but i have heard such good things about them. i looove those colors! I’ve never tried essie, i don’t like to spend a lot of money on nail polishes because i like to change the colour of my nails every 2 days so i go for cheap and more hehe, buut if i’m lucky this could be my chance! Bright, pretty= Spring! Sign me up, please. Great colors! Please enter me! Enter me please! These colours are gorgeous! <3 Nail polish! Enter me please!! Gorgeous spring colours, enter me please! Enter me, these colours are lush! enter me! i’ve been wanting to try mint candy apple for ages! Ooh, I love the mint shade. Please enter me! Oooh please enter me! I’ve wanted Mint Candy Apple since it came out and the other 2 look gorgeous! Please enter me – I’ve been admiring these shades for awhile. I’ve never tried Essie polishes–mostly because I’m a brights-and-glitter girl–but those 3 colors look INCREDIBLE! Enter me, please! Stunning colours… Enter me please! So beautiful, just in time for spring! Those colors are incredibly pretty! Thank you for hosting this giveaway again. It’s truly appreciated! pick me, pick me, pick me! thanks for another great prize! This is the best giveaway so far! Oooh, these colors are so pretty! I especially like Bermuda Shorts. And now I’m thinking warm, summery thoughts, especially needed on the East Coast in the US right now. Such pretty shades-thanks for the chance! Ooh, Mint Candy Apple looks gorgeous! I’ve wanted to try Mint Candy Apple for awhile now Love the pretty colors you picked! They remind me a lot of spring. I have a weak spot for purples and mints, so these look amaaaaazing! Oh that pink is amazing! These polishes are so cute! After ANOTHER weekend of snow these colors make me yearn for spring–I can’t wait! I don’t really enjoy islands, but Bermuda Shorts is luscious. Such pretty colors! And they look so nice together. Yummy, Mint Candy Apple. All three are lovely though. Those colors are really realy girly and pretty! I would so like to have Mint Candy Apple! Please, enter me. Yes please! Would love these.. Such gorgeous colours but the pink is definately my favourite! I’ve been trying to not buy Mint Candy Apple for forever! I LOVE Mint Candy Apple. Would love to try the other two! Oh, geez, please! I’d love to try Essie – I have only one so far, but it’s fabulous! This just reminded me, I have to do my nails tonight! Oooooooo- gorgeous colours! Please enter me. Love these polishes! Enter me please! Love Essie1 Enter me please! love these colors, yes please! Definitely want to win this, enter me, fleez. The purple is so pretty! Please enter me! Beautiful! I love Bermuda Shorts. Enter me please! I love essie polish and don’t have these colours! Please enter me! Thanks! oh lovely give away thanks. I love the green! I’d like to enter please! I just need bright colours in these dark times in Holland! They’re sooo gorgeous! Would love to win! They look gorgeous. Enter me please! Yay please enter me for Essie! Thanks! Please enter me! I love Essie!! Sorry about your site, it must have been a great piss off! Lovely shades, please add me to another fab giveaway. bermuda shorts looks very pretty! I would love to try that one, and I love mint candy apple! that pink is so Barbie it’s amazing! I love the brightness of these! My finger nails and toes are screaming: please, please enter me! Cute Essie nail polishes. Please enter me! Essie polishes are so good. They last very long on my nails. I rank them pretty high, right up there with Chanel polishes. Pretty pretty :-). Enter me! So pretty – please enter me! I LOVE these colours so much! I feel summery just looking at these! I’m loving the mint candy especially. I love this set <3 Please enter me! I love the bright pink one – enter me please! Please enter me.. these look perfect for spring! 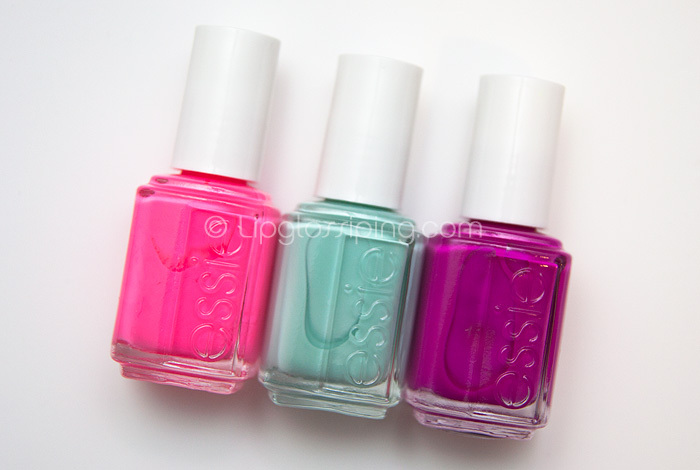 the 3 exact colours i have been wanting to try from essie, im not even joking! I’ve always wanted an Essie nailpolish!! p.s. love your blog just found it recently! I love this one! Enter me. Hello, please enter me as well thank you! I would love to try some Essie nail polishes, so please enter me! spring color! so adorable, love them! Awesome colors! I gotta win these! Hi Charlotte please enter me! Essie (new word for yes) Please!!! Enter me, please! I love Essie (but it’s very hard to it get here). Wow these colors are perfect for spring! Enter me, too! Those shades are just delicious! Ooh I’ve been wanting to try MCA for ages! the new spring shades are gooorgeous.. enter me pretty please!! it’s my b’day today so I would love to win these beauties!! Wow those colours are beautiful im a big fan of essie! GREAT picks for today’s giveaway! thanks for the opportunity luv! I love Essie! Enter me please! Beautiful, remind me of the summer! enter me please these polish’s look fab! Enter me cross my fingers! PS: Apparently, my comment is too short… Is this long enough WordPress?! Never tried any essie polishes but I’d like to, enter me please. Enter me please. Those colours look suuuper pretty! Oh can I enter please?! Cute colours. Enter me please! Thank you. I love the Bermuda Shorts colour. i LOVE essie, and mint candy apple is probably my favorite! Enter me please, I love Essie nail polishes! Love these! :o) Can’t wait for spring. Please, enter me. Duh, how is it reached day 3 before I’ve remembered to enter!! I must have my January hibernation head on!! Please enter me & accept my apologises for ignoring you! I’d love to try some bright Essie shades – I have a couple of their polishes in neutral tones and I love them. Please may I enter? Thanks! Ooooeeeh bright colors <3 count me in please! Lovely lovely! Count me in too! Fab shades, please enter me! Pastels and pink XD Enter me I’m crazy for Essie! Enter me please ^^ they’re gorgeous. I love Pink Parka, and Mind Candy Apple! I really like how even though Essie practically specializes in classic colors, they are not afraid to deviate into more adventurous colors. Oh, I love essie almost as much as your blog. Fresh and lovely for Spring..please enter me. please enter me I’ve never tried an Essie polish but heard so many great things about them! enter me please they are gorgeous! Please enter me. I really love the Bermuda Shorts color! The 3 together look like a promo pic! OMG I’ve been wanting to try Essie especially Bermuda Shorts!!! Makes me wanna eat candy! 😀 I loove em haha. The sweetest colours Enter me! These look beautiful! I’ve wanted Mint Candy Apple for ever but you can’t buy them here… I’d ike to enter! ooh i would love to win these!!! Ohh so very pretty and fabulous! And a thank you for a gorgeus blog at least you have one Icelander very very hooked!